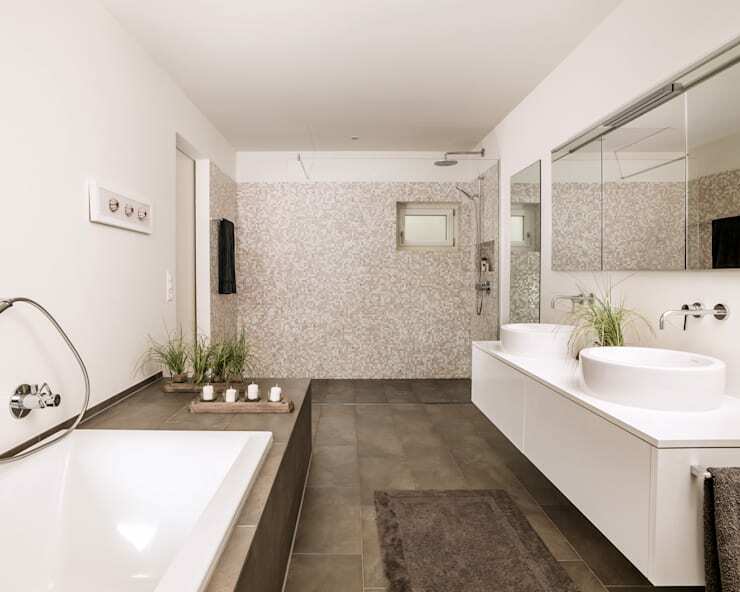 Whether a super compact bathroom or an XXL one, shower area is a fixed feature. A shower can be truly rejuvenating when the ambiance adds to the experience. With so many new shower variants available at all price points, it is easy to get lost in the limitless choices. Here we present some worthy options that would make you want to upgrade to a new one just because they are so beautiful and chic. So go ahead and explore these handpicked bathroom shower ideas for the next upgrade. 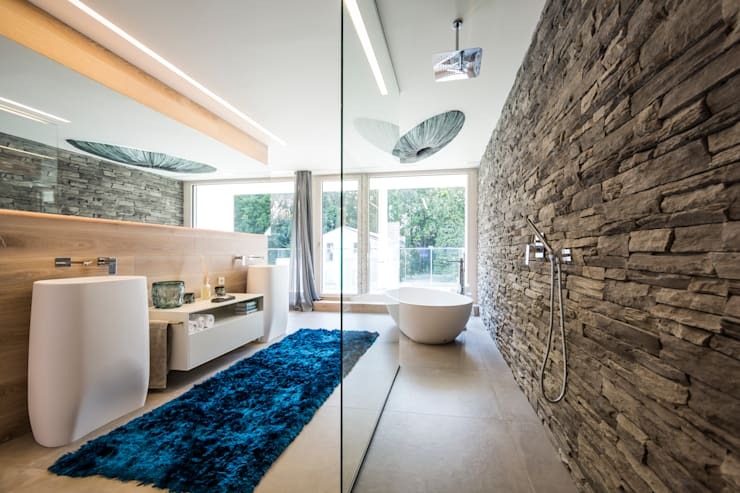 The stone wall in the shower is in sharp contrast to the ultra modern bathroom decor. The stones offer a three dimensional feature and needless to say, a whole lot more personality to the space. The shower head above offers a beautiful rainfall like outlet, making shower time a pleasing affair. Lighting can really make or mar the ambiance of any room. When it comes to shower, this fancy lighting option adds to the glamour of this modern chic bathroom. 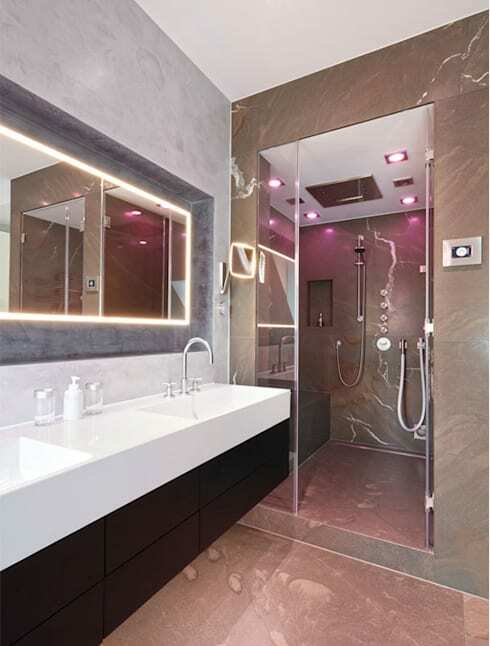 The lilac color lighting goes so well with the all brown marble on the floor and walls. If choosing the right color for lighting is too confusing, then get the ones that have changing color options to suit every mood. With modern drainage systems, it is easy to install shower area where previously thought impossible. 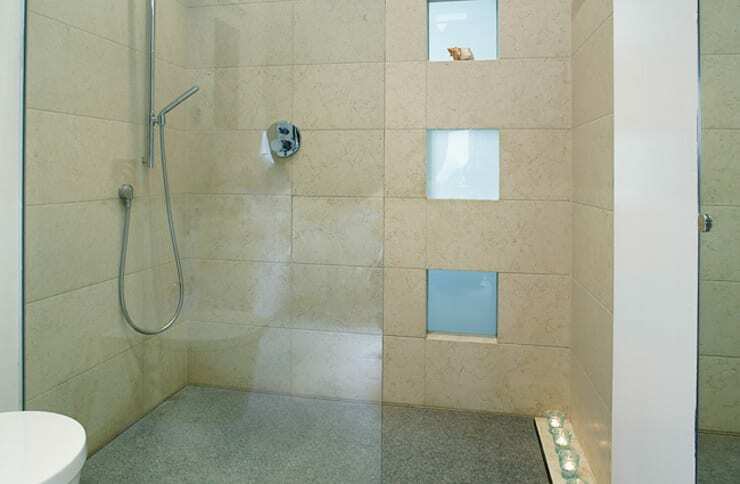 This clear glass shower area remains completely separate from the rest of the bathroom which is dry and decorated more in the lines of an elegant living room or a lounge. Like a showcase, the bathroom allows insight from all sides. Natural elements have a way of creating more earthy experiences. The eye catching natural white marble with grey lines creates a sophisticated yet grounded decor in the shower area. Also, young children and older people would love the idea of an integrated bench in the shower for more comfort and safety. If adding natural stone in the entire bathroom is not your cup of tea, then using it only in the shower is great too. This natural stone in grey looks quite at home next to the wooden floor in the rest of the bathroom. Its a clever way to make this mini shower look distinct as well. 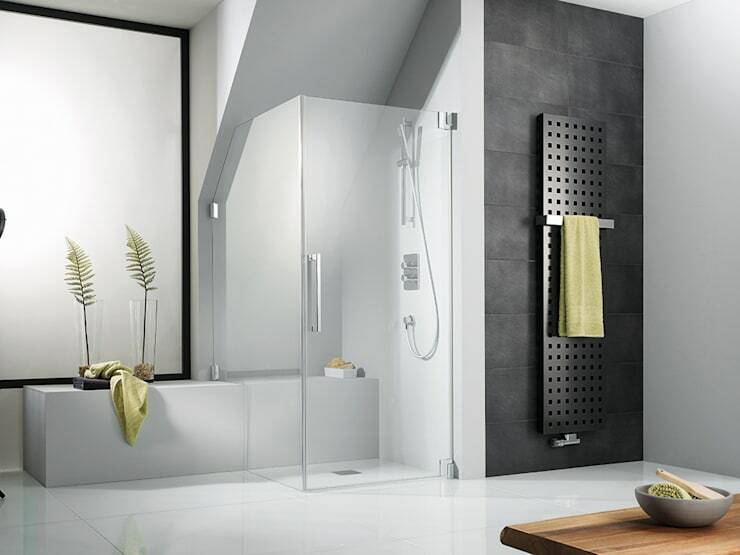 Those blessed with big showers have the freedom to play with more design options and addition of accessories in the decor. This big size yet simple bathroom has a pretty huge shower that is cleverly distinguished through the use of mini tiles in a different design from the rest of the room. 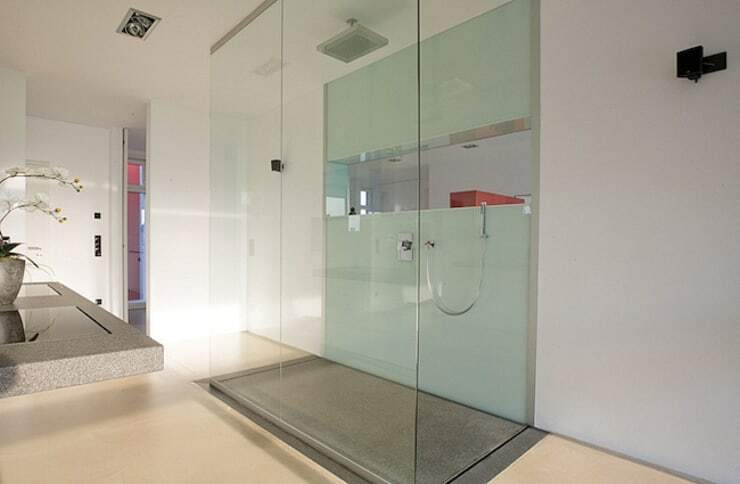 Notice the absence of shower curtain of a glass divider… .that's the luxury of space! Clever use of space and ingenious design make shower time a pleasure even in this compact space. The area under the sloping roof is well utilized allowing more open space in the rest of the bathroom. This clean minimalist clutter free design is much suited to modern bathrooms of most city homes. Sometimes adding rails, racks, metal baskets etc on the shower wall can hinder movement or simply disturb the harmony of the decor. When minimalism is your style then wall niche like these are perfect. Incorporate these in the walls for storage space while background lighting in different hues can be added to up the glamour quotient. 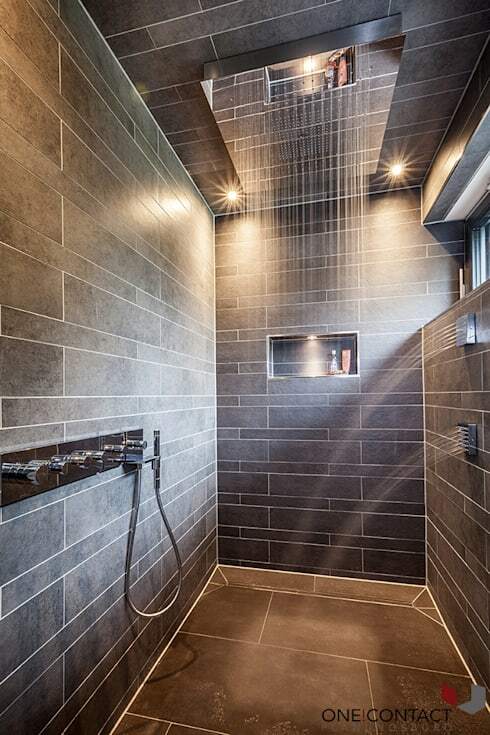 A large niche is created in this shower allowing huge storage space. The mirror is a unique addition allowing reflection and thereby adding to visual space. This can also serve as an alternative to the typical bathroom mirror cabinet, a worthy idea for for smaller bathrooms. Your own input with creativity of interior designers and architects can lead to many such brilliant ideas. Shower tile ideas can add a great deal to visual appeal of any room. The white connections against the dark grey natural stone provide a sharp contrast allowing the tile pattern to become the focus. Not to mention the indulgent showers on top and side as well as well thought out lighting add to the allure of this dreamy bathroom. Check out these modern tile arrangements that have the power to add a touch of class and creativity in house interiors.